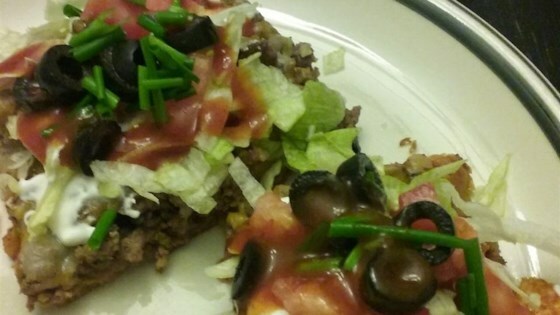 "A great 12-inch taco pizza for any occasion. You may also want to try some sour cream for dipping slices." Place the ground beef in a skillet over medium heat, and sprinkle on half the package of taco seasoning. Cook and stir the beef until browned and crumbly, about 8 minutes; discard excess grease. Spread the pizza dough out onto a 12-inch round pan, forming a rim of slightly thickened dough around the edge. Mix together the refried beans with salsa in a bowl; spread evenly over the crust. Mix tomato paste, water, chili powder, cayenne pepper, and the remaining half of the taco seasoning mix together in a bowl, and spread the sauce over the refried beans mixture. Top with the cooked beef, sprinkle the onions over the pizza, and evenly spread the cheese on top. Bake in the preheated oven until the crust is cooked through and the cheese is bubbling and beginning to brown, 15 to 20 minutes. Taco and pizza nights come together in one delicious, cheesy pizza. This is exceptional! Only change, instead of water, I used Ro-Tel. This was a great pizza. My family had 3rds! Soooo good! I left off the onions because my family does not like them - but I had them on the side along with tomatoes, lettuce and guacamole. It was perfect and the kids actually ate it! I made this and it was delicious!!! Omitted the beans, not a fan. Amazing flavor, I precooked my pizza crust and used tomato sauce instead of paste. I did not add the water. Turned out Great! !